In Hamilton in 2013, consultant for the now defunct National Fluoridation Information Service, Dr Robin Whyman explained the new theory. He said that when fluoride is swallowed, it is stored in the bones and soft tissue. It is then released during the day into the blood stream and eventually secreted by the salivary glands, providing a topical benefit to the tooth surface. 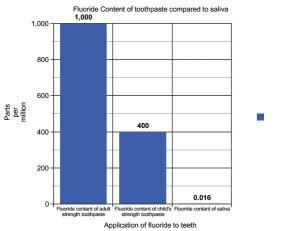 But simple math shows this new theory does not hold water any more than the older dis-proven theory as the amount of fluoride required for topical benefit is much higher than what is secreted from the salivary glands. The Ministry of Health advises that children should brush their teeth with adult strength toothpaste containing fluoride of 1,000 parts per million (ppm) rather than the child strength toothpaste, which only has 400ppm. They say that 400ppm is not strong enough to provide a benefit. Yet fluoridated water only contains 0.85ppm and the amount secreted into the salivary glands is only 0.016ppm. This doesn’t add up. If 400ppm child strength is not strong enough to provide a benefit, how can the 0.016ppm that is secreted from the salivary glands provide a benefit? 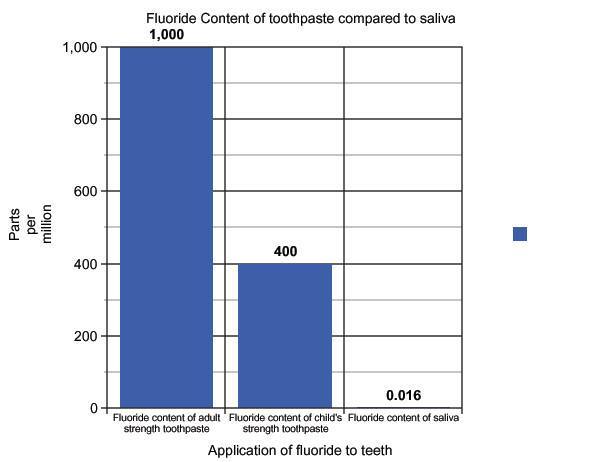 0.016ppm is approximately 62,500 times less fluoride than 1,000ppm in adult strength toothpaste.The New Zealand dentists group Fluoride Information Network for Dentists also explain scientifically why this theory is flawed. However, you don’t need to be a scientist as common sense tells us that this is not a credible theory. Remember, they were wrong about the previous theory.